Summit Cove Elementary student Adam Thomas may only be 9 years old, but he’s got the eye of a professional paleontologist. Thomas found some fossilized clams from the Cretaceous Period near his home in Summit Cove, which were recently deemed authentic by a paleontologist from the Denver Museum of Nature and Science. The fossils are of the Pierre Shale formation and date back roughly 80 million years, when a large portion of North America (including Colorado) was underwater. “I was really surprised that there would be fossils up here in the mountains,” Thomas said, who has six of the Pierre Shale fossils in total (two much larger than the others), which he keeps in his bedroom. Thomas started finding the clam specimens last year, and found another large one this summer in the same spot. His family finally decided to bring them down to the museum, where paleontologist Bryan Small checked them out. Thomas’ finds aren’t something the museum sees all the time, especially from a 9-year-old kid, Small said. But, the fossils are what Small would expect to see from the Summit Cove area. 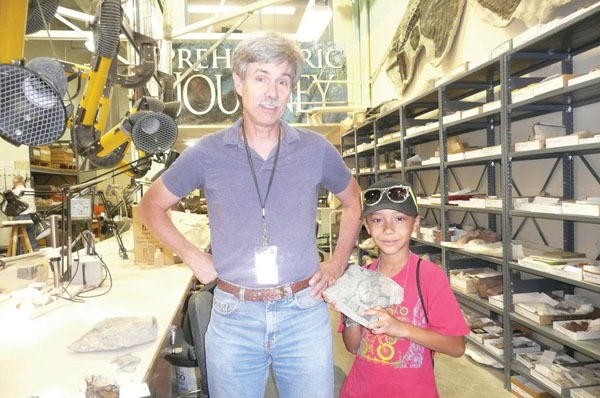 Thomas has always been intrigued with rocks and fossils and minerals, his father Andy Thomas said. Andy Thomas attributes his son’s good eye to the family’s museum visits, including the Dinosaur National Monument in Utah. Adam Thomas also has some petrified wood he found camping near Colorado Springs. As for where he found the fossils, Adam Thomas isn’t giving up the exact location, but did mention they weren’t anything he had to dig for. In fact, they were right in the open, and probably passed by numerous adults, he said. “I really don’t want to tell exactly where I found it, but it was in my neighborhood on the side of the road,” Adam Thomas said. The elementary student’s “good eye” is a trait most professional paleontologists start out with, Small said. “He should just keep looking because you never know what you’re going to find out there,” Small said.